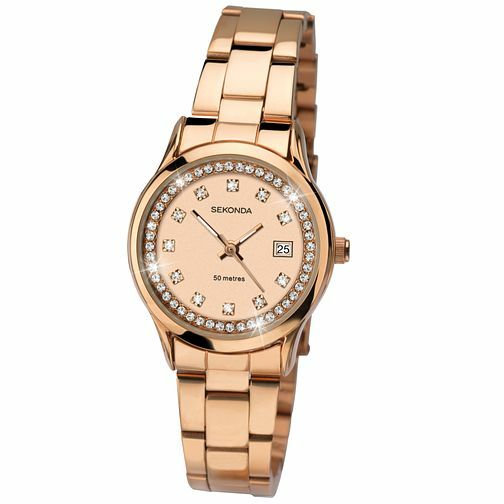 Indulge in rich warmth and sparkle, with this glamorous rose gold-plated stainless steel bracelet watch by Sekonda. Styled with a rose tone dial with date window and finished with dazzling stones for a light-loving look. Water resistant to 50 metres. Sekonda Ladies' Stone Set Rose Gold-Plated Bracelet Watch is rated 4.0 out of 5 by 3. Rated 4 out of 5 by Anonymous from Lovely looking watch Bought as a birthday present. Great value for money. Rose gold bracelet is lovely, although clasp a little tricky to open and close. Rated 4 out of 5 by Anonymous from Reasonable value for money Looks beautiful, decent value for money. Easy to wear.